“How many cubic inches do those bikes have?” The farmer lurched toward us: red suspenders and a Saint Nick belly and a toothy smile. Hand extended, Life Saver mints in his huge cracked hand. Which I took. You never know when you are going to need a Life Saver. 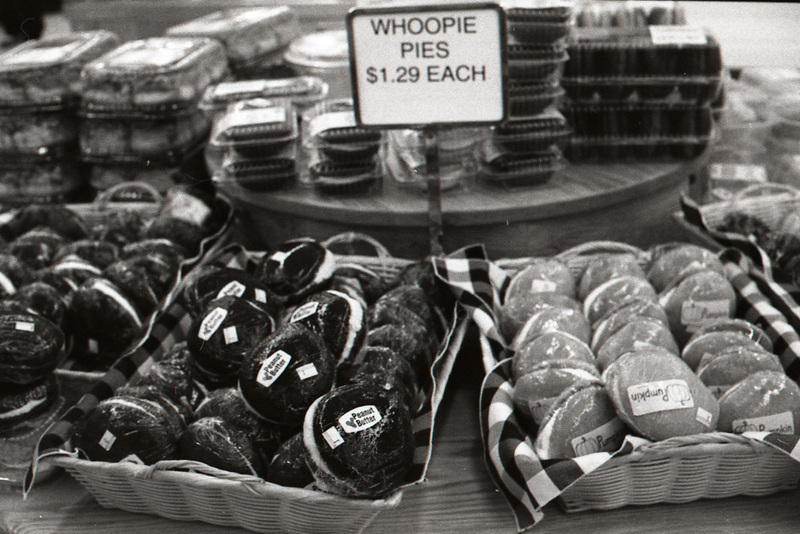 I noshed a Whoopie Pie and reviewed a salt soaked cue. Only 35 miles in. Wide open rollers, Amish guys threshing wheat with horse-drawn machines, silent in the fields, trees soaked in color, grass neon green from the rains, roads just damp enough for the tires to sing on the pavement. Wood stoves seeping smoke into the tree line, sweat splattered top tubes, and we pulled into Milheim’s ShurFine with its plethora of sugar: cake confections in avocado green, purple and copper, every variety of gooey gummy saccharine encrusted worm/egg/gum drop sugar bomb in colors clearly not endorsed by mother nature, piles of chocolate and malt and carmel coated popcorn with peanut clusters covered in peanut chocolate… Brandon’s brain shut down. He mentally hibernated, shutting off synapses rev’d into the red by constant cadences. The Don BradDon can put away some chow. His diet is based on the concept of primal bodily cravings: the Don feels insufficient in fiber so he pounds salad breakfast lunch and dinner, with fibrous scraps of spouted mini toasts and coconut milk in between fixes. He feels the urge for protein and boils German breakfast sausage, scarfs bacon and chicken, ingurgitates gallons of milk. The sweet tooth of the man rivals Santa Claus. Cravings for cookies are sated by cramming a cardboard box of cinnamon cookies down into his bottomless stomach. Chocolate bars and Jelly Beans boost morale whilst offering painful payback later. His stomach, logic centers, and primal urges battled and bled on the tiled floor. Miraculously, his logic centers, the weakest facet in most fights, won. He cruised by the sweets. Bought a bag of Craisins. The man is full of surprises. The clock advanced. I finished the Whoopie Pie and we clipped in. Past Penn’s Creek, roiling with recent rain, we turned left and up. Dirty Siglerville Milheim Pike loomed large, a category climb up the ridgeline. 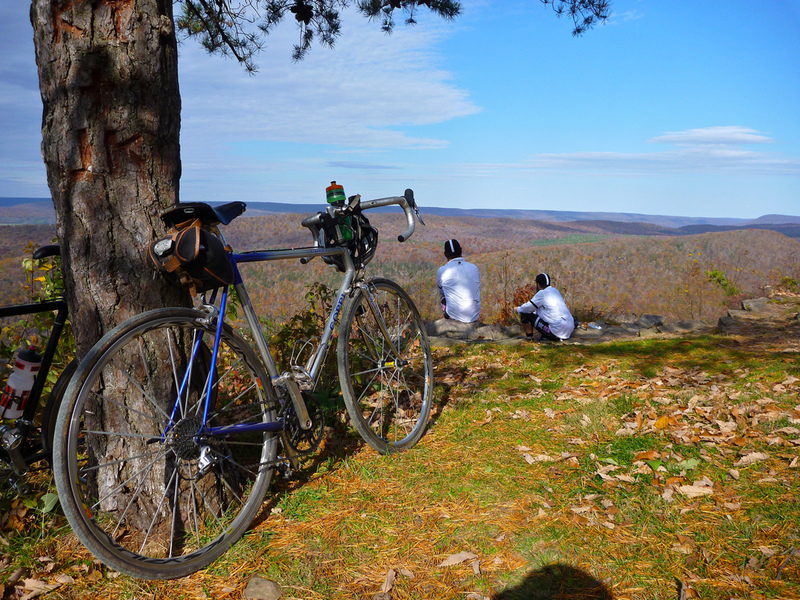 Shifting low, we slogged up the slope, gravel and big views on the immediate horizon. The first overlook told the guys what they had done: ascended a monumental mountain for a top-drawer tableau. Happy Valley burgeoned beautifully. An old man snapped our picture. The sun sank. Clip in, ride on. The terrain turned asperous, rocks jutting and jumping in front of fragile wheels. Pine scent penetrated flared nostrils. Soft needles obfuscated obstructions. The path to the main attraction was undulating raw umber, twisted trees and maleable marl. The view attained: big vistas, slanting afternoon light, whipping winds, the Don’s carrot cake. A Penn’s Creek traipsed the topography. Riots of color flared on ripe ranges. John snapped photos. We silently mocked the guy with the big camera who had driven (the horror) up here, only to miss the golden hour. We noshed foil wrapped sandwiches and perched on the precipice, drinking the diaorama.Time ticked. We mashed it down the mountain, bouncing down a stony pass. An artisanal spring slaked our thirst. We had come down the far side of the ridge, and in truly sadist fashion, had to climb it again. The pass led back up the tor, where we ran a ridgeline road into encroaching darkness. A crossroads provided a bail point. We weighed options. Continue in continual darkness, or surrender to sense and submerge ourselves in the valley, where light would provide semi-safe passage home. We abdicated our man cards for the day. The descent proved worthy. 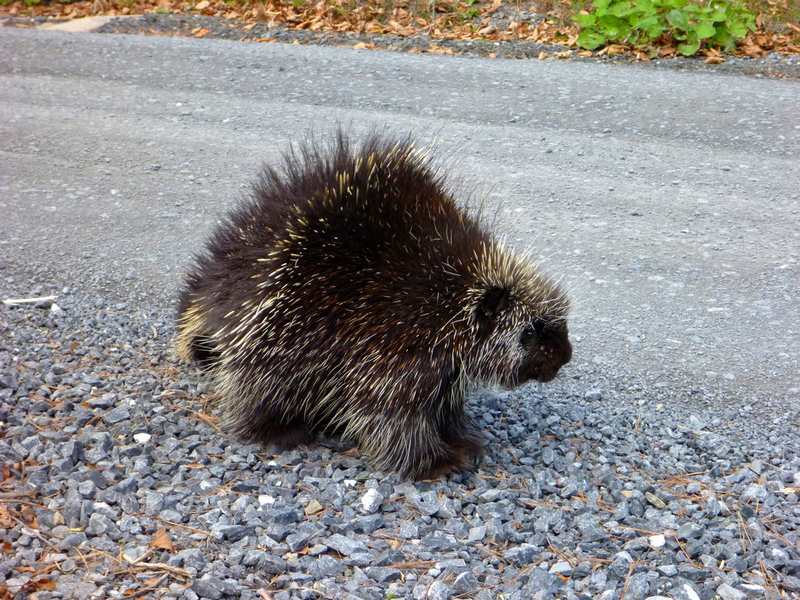 Whipping ’round wrinkled bends, a porcupine ponderously paced across the dusky road. His hackles raised, but his pace unhurried, he wandered into the weeds. John, having longed to see such a beast for years, abandoned his bike and snapped copious photos, inches from the twitching tail. Our ride resumed, only to halt, almost instantly. A much larger Porcupine stared at us from a bend. He stood like a medieval sloth, a plethora of prickles. John approached with caution. This fella was frisky. His countenance was confused as we accidentally surrounded him. He carved a quick circle and high tailed it into the brush. Moments latter he was mauling some misshapen tree. The sun slanted low, cutting behind Mount Nittany. Our route sliced the valley. We ate more dirt and time trialed it home. The sun set was phantasmagorical. Contails cut pink and purple sky. Cobalt descended into Delft blue. Ribbons of road stretched into darkness. My legs found fuel, and I kept John and Brandon’s tail lights in check. Our headlights dissected the dusk. The landscape was reduced to large cutout shapes, the mountains, a slow-moving herd of dinosaurs, the houses passing like ships at sea, the windows providing the sole definition of shape. A cascading stream, the emerging moon caught the water and lit it up, brighter than the mail box reflectors that buzz by: huge round fire flies. The water was a series of lapis lazuli slashes on a black velvet canvas, sparkling like the interior of Joseph Cornell’s dreams. We arrived at the car. Wet lycra replaced with warm wool. We hauled downtown. Time for some food and a pint.